Romance is in Full Bloom. Romance is in full bloom with this the Alice + Olivia Celia Blouson Sleeve Top. Ambience is all about transforming your look with this top as it is the perfect way to dress up your favorite maxi, trousers or jeans. 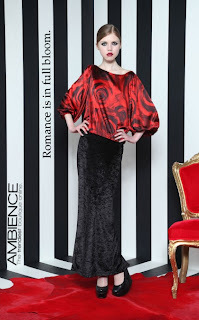 This top is gorgeous with a dramatic sleeve and blouson silhouette. The royal rose print is perfect and has a hint of vintage and is totally on trend.